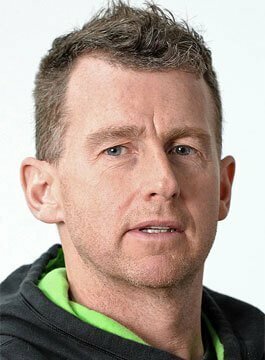 Nigel Owens MBE is recognised one of the world’s best rugby referees. He is also the first openly gay man to referee at the highest level. Born and bred on a council estate in Mynyddcerrig, Wales, Nigel first picked up the referee whistle aged 16. He officiated his first international game in 2005 – a match between Ireland and Japan in Osaka. Two years later in 2007, Nigel made his World Cup debut where he refereed the Argentina v Georgia game in Lyon. Nigel is one of two referees ever to officiate two consecutive Heineken Cup finals (2008 and 2009). In 2015, he refereed the 2015 Rugby World Cup Final between New Zealand and Australia at Twickenham. As well as refereeing, Nigel Owens is a co-presenter on S4C’s ‘Jonathan‘ – the rugby-themed Welsh language show hosted by Jonathan Davies. In 2007, the gay rights group Stonewall named Owens as ‘Gay Sports Personality of the Year‘. At the National Eisteddfod in Wrexham, Nigel became a member of the Gorsedd of Bards . In November 2008, he released his autobiography in Welsh called “Hanner Amser” which means Half Time. Awarded an MBE for services to sport in June 2016, Nigel continues to referee rugby matches around world. Off the pitch, Nigel Owens is an extremely popular and entertaining after-dinner speaker. In 2017, Nigel was a guest on BBC Radio 4’s ‘Desert Island Discs‘ – listen to the interview.